Linco Precision’s Bio-Plier, the alternative to the TerraGator is available, built to YOUR specs!! Custom built for city municipalities Bio Solids divisions or for Agricultural Farm Manure Spreading. Over 35 years’ experience in Bio Solids Application equipment. 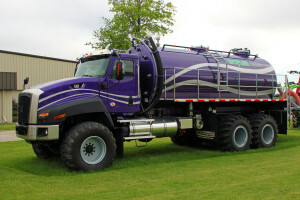 The truck units are offered in Freightliner, KW and Western Star chassis; available in 4x2, 4x4, 6x4,and 6x6, can be used for dry or liquid application. We pride ourselves on providing you quality product built to last not just for today, but for many years to come. Take some time, make the call, see what it costs to own the equipment vs contracting the work out. We offer steel tanks from 2000 gallons up to 6000 gallons. Aluminum tanks 900 gallons to 1500 gallons, single and dual compartments. Reconditioning of existing equipment is an option available to you with us. We are a family owned business built on Midwestern values, passion and dedication to quality and innovation, and we can wholeheartedly guarantee our products meet or exceed your expectations. As technology and new equipment evolve, so does the hunger for innovative and convenient suppliers that keep up with the everyday rigors of meeting customer’s demands and expectations. At Linco-Precision, you get the best of both worlds, an unmatched ease of doing business and the highest quality replacement arts that you trust. We know how vital it is that receive these products the quickest way possible; to help shorten transit time, we may ship your order direct from the closest distribution center. We are proud to represent some of the top manufacturers in the business: Arthur Tank, Chandler, Moro, NVE, LMT-VaxSteel, Mid-State Tank to name a few. Please do not hesitate to call on anything for your machines. We welcome the opportunity to speak with you on phone, meet with you at your facility or ours. Custom built for city municipalities Bio Solids divisions or for Agricultural Farm Manure Spreading. Many other options available in liquid or dry. Over 35 years experience in Bio Solids Applications, On and Off Road Equipment and Service Repairs. Contact John Kelly for more details or for a field demonstration. Smart Trax, Auto Steer and Viper Pro were added to this unit by Linco Precision to monitor the liquid application rate. Contact us for all for all of your reconditioning needs!